Avid quilters may enjoy a good challenge. While there is a large variety of bed quilt patterns, wall hangings, and even art quilts, the sheer size of these projects and their complexity can be a little overwhelming. Quilted potholders are perfect for beginning quilters or even the experienced quilter who just needs a break from big projects. The potholders featured in 110 Quilted Potholders offer all of the benefits of quilting without the large time investment. Each pattern results in a finished quilt project that is as practical to use as it is to make. If you need a mental break from large quilt projects, these are the perfect small patterns for you! These potholders are more versatile than you might imagine. While the projects are straightforward and simple in their design, the blocks are great for creating larger projects later on. If you find a potholder pattern that you really enjoy making and you love the way it looks, you can create several potholders and make a mini quilt, throw, or even a bed quilt. Feel free to experiment with different colors and patterns of fabric. These potholders make fantastic gifts, and the generic designs make them applicable for any season. Each quilted potholder pattern includes an assembly diagram, templates, and list of materials needed. 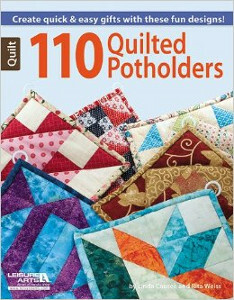 With directions for over one hundred quilted potholders, there's no reason not to start now. Whether you're a novice quilter or you're an expert, these patterns are great for everyone.